Guatemala, the Honduras border and all of the El Salvador that lies in-between. Did it all in one day on a relaxing Sunday excursion w/ Familia Rodriguez. Our destination Sunday Morning was the Aguas Termales de Santa Teresa in Ahuachapán, near the Guatemalan border. 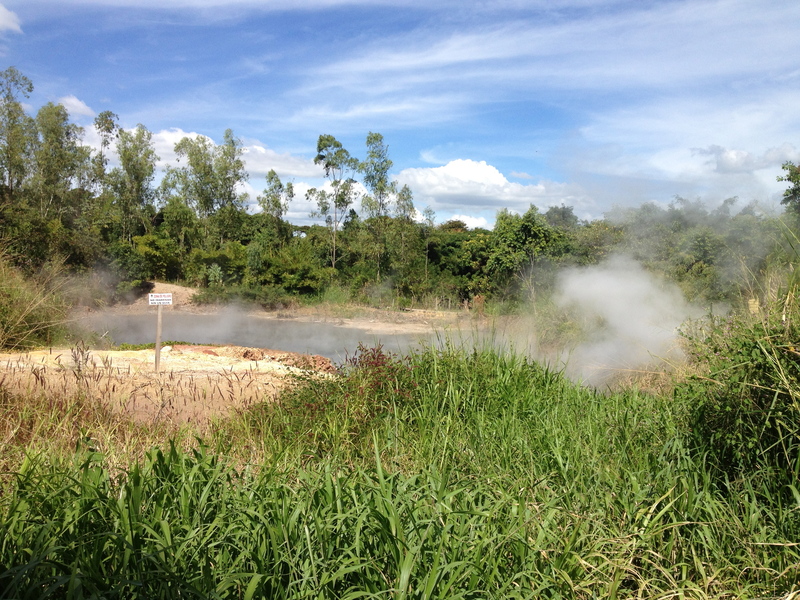 These ‘thermal waters’ are heated by the nearby volcano. Departing from San Salvador, the drive leads away from the city. Paved roads soon became dirt-covered, rocky one-lane passages. Stores and apartments gave way to countryside with sparse, make-shift housing. People and dogs wandered about, walking in the afternoon sun. The road grew more and more narrow as we neared the entrance of the Santa Teresa Termales. At the point of the entrance was a grassy field with a pond that seemed to billow smoke. The steam rose in swirls above the water. See Video. Pretty interesting. Needless to say, the time spent at these relaxing waters provided a contrast to the high-energy work schedule of the preceding week. Combine all of this hot, spring water w/ the fertile volcanic soil that adds up to growing beans that make great coffee. 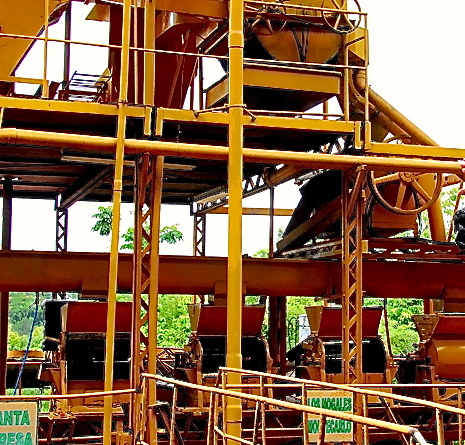 The mountainside that’s not oozing steam is covered w/ Really Big Machines and mounds of coffee beans in process. This coffee is processed with the thermal mineral waters that are heated by the volcano and produce some of the most flavorful organic coffee in the world. One last stop ‘between the clouds’ at the Entrenubes Café – another relaxing getaway full of food and flowers. 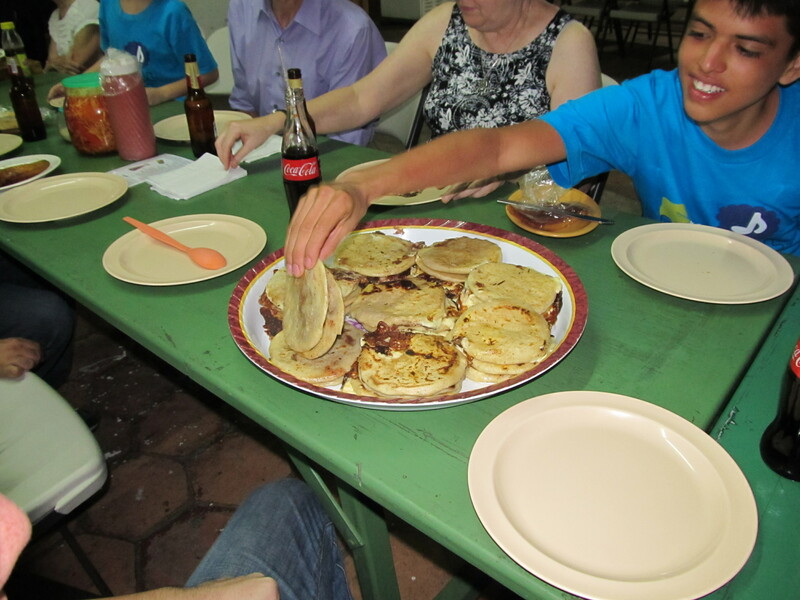 …and just because it was so much fun…here are some final pics of the After-Concert Party at Abbi Pupuseria, Planes de Renderos – the village famous for it’s fantastic pupusas! Link to all of the pictures!! Looking forward to when I can return to Central America! Back home now and ready to share about the closing days of the VI Festival in El Salvador. This year’s festival was bigger than ever. 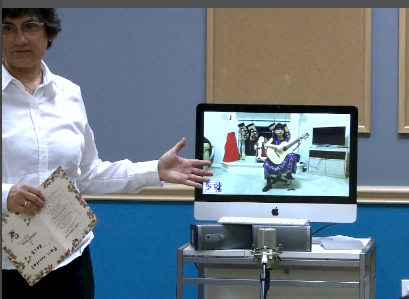 Teachers in my course represented four countries: Guatemala, Costa Rica, Nicaragua and, of course, El Salvador. Our classes were held in the Albert Einstein University in nearby Antiguo Cuscatlán. Many teachers and some of the students traveled in a delegation from Visión Mundiál (World Vision) in Guatemala. There they are doing great work providing Arts Education to underprivileged families. This video is in Spanish, but you get the idea. Guatemala ‘Visión Mundiál’ in the news! One afternoon, right outside the window in my classroom was the bird that the Barrios composition “Bicho Feo” was named after. Since I recently uploaded a video of this piece, it was really cool to be seeing the bird ‘Live!’ He was chirping away in the same manner as the intro ‘sweeps’ from the piece! It happened the next day, too, and this time I pointed it out to everyone and asked if they recognized the bird. They didn’t recognize the name as it’s more commonly known as benteveo. In some places, they believe that when benteveo cries it’s unique melodic call beside a house, he is announcing the arrival of unexpected company: relatives, friends or strangers. In other places they consider it a birth announcement. In rural areas of the Argentinian coastline, it’s cry is generally considered a warning of a bad omen which one should flee to avoid. A legend of the guaraní tribe says that the benteveo was a wicked grandson who the god Tupá turned into a bird because he would not give his dying grandfather a glass of water. Now I really know more about this bird than I probably ever needed to!! 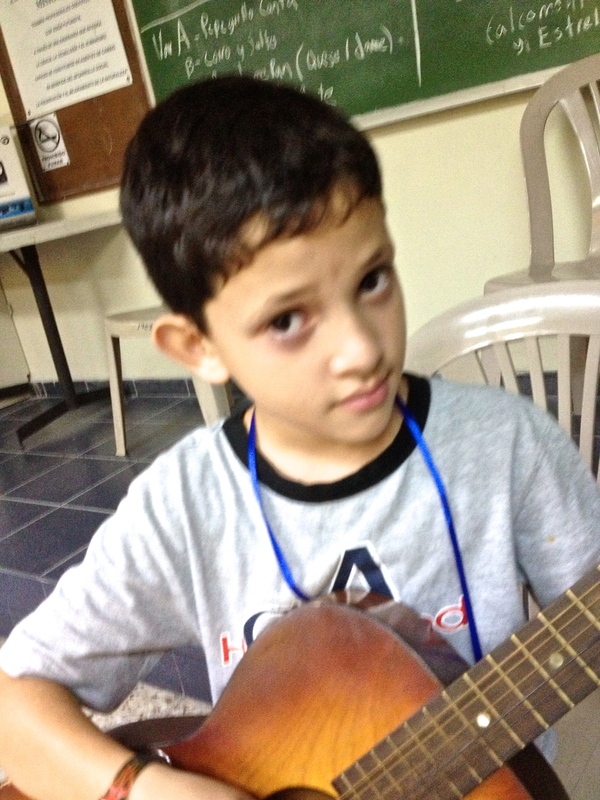 Santiago was my last student every day of the festival. 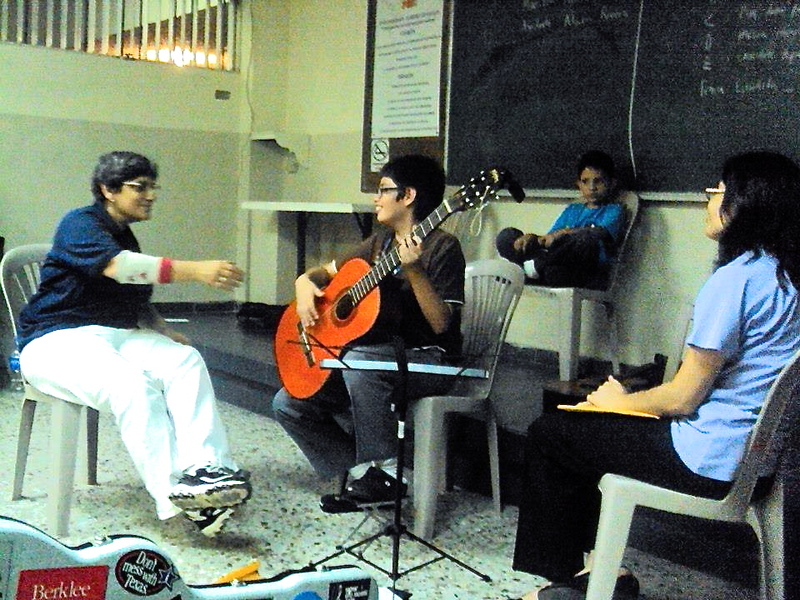 He also plays cello, so his guitar lesson had to fit in around all of the cello classes. Since his dad is the festival director, I’ve watched him grow up to his ripe old age of 8. On the day of the Final Concert, Santi was the most enthusiastic vibrato-er of all. He didn’t miss one chance to use vibrato on the long notes of the pieces we performed as a group. Funny thing – he was the only one! Many of the others know about it and should have been playing with vibrato. There he was – because he’s restricted from it’s use on cello – faithfully and beautifully vibrato-ing his little heart out on his guitar. MY TOOTH IS IN MY POCKET. Flying early Saturday from Houston to San Salvador is a good time for a first-class upgrade. It doesn’t happen too much anymore since United and Continental merged because there are so many more VIP customers with United. A big woo-hoo! A couple of confused folks thought I was in their seat due to the similarity in numbers of the gate – E2 – and my assigned seat – 2E. Other than that, it was an uneventful flight. The VI Festival Events began Sunday Evening. So, Saturday was a day to settle in at the Hotel Terraza, change guitar strings and later, meet for dinner. 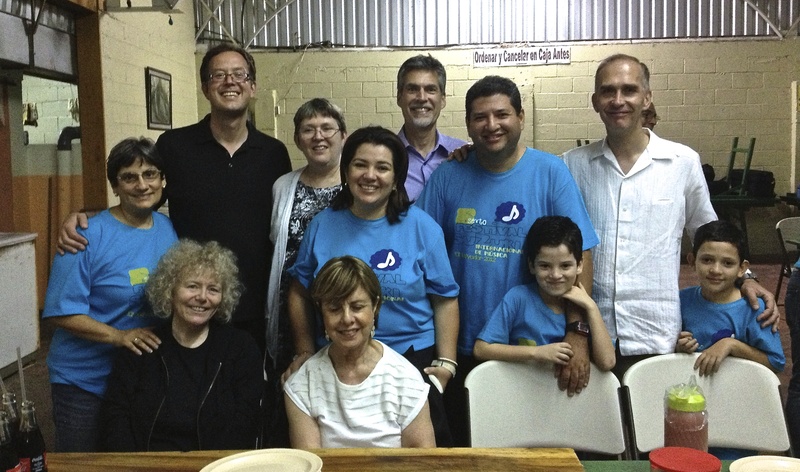 Festival Director Julio and his wife, Alma, took the three teachers who were already in town – Barbara, Caroline and me – to a favorite local restaurant – Tipicos Margoth de El Salvador. Margoth celebrates 50 years of service this year and the food is well-known for being authentic. 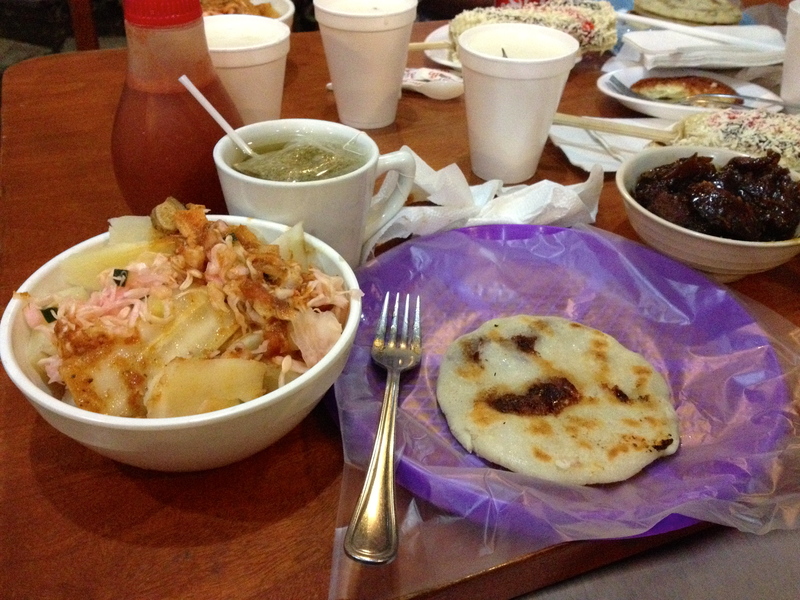 I can’t tell you the names of much of it, except for pupusas – the runaway national favorite of all foods. Margoth is laid out sort of like Luby’s or LaMadeliene. You walk past items on display and tell the servers what to put on your tray. Typical food of El Salvador – yucca with vegetable/salsa topping, green tea, bean and cheese pupusa, pumpkin soaked in sugar and cinnamon. I CAN tell you about another local food. 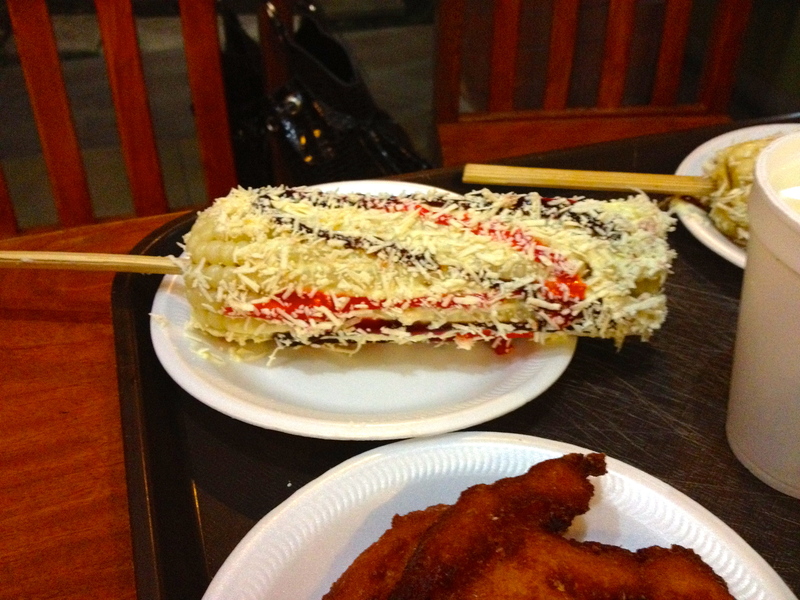 Elote Loco (el-LOW-teh) is corn on the cob rolled in a grated cheese mix and then drizzled with mayonnaise and salsa. Sounds strange, but looks interesting. I decided to give it a try. In return, it pulled out my front tooth. As in, there it was, on the cob next to the corn. Hence the title of this entry as my tooth actually *was* in my pocket – in a little plastic vial of water. “crazy” corn on the cob. This stuff broke my tooth. Maybe it’s not totally to blame, though. I’m so happy to have all of my teeth together again that the prospect eating only soup, oatmeal, ice cream and the like is really OK with me. That evening the Opening Concert was very successful. It’s a nice reunion with students and teachers from past years as well as an opportunity get acquainted with new ones. At the end of the evening post-concert reception on my way out of the buiding, somehow I tripped on the pavement. With my guitar in the heavy Calton flight case strapped to my back. It was embarrassing enough, so just got up and kept walking. Everyone says my Spanish is much better. Which is funny – because I was disappointed with my preparations. I listened repeatedly to recorded podcasts about using the conditional and subjunctive tenses, which are advanced for me. They never really made sense and I did not master them. However, there are some vocabulary words I picked up as well as more confidence just using sentences and simple constructs. When we started classes Monday and I met with the students for the first time, it was natural to speak in Spanish to them. As the afternoon ticked on, however, I felt my brain on overload and when one of the kids said “I speak English. You don’t have to teach me in Spanish,” I actually took him up on it. Usually “I speak English,” means they go to an “American School” in San Salvador, which does not necessarily mean they are conversational and often they do not understand simple instructions. In addition, my foot and one knee were bruised from my fall the night before which did not become apparent until I started teaching the afternoon waves and waves of students. One hour in particular, 7 students reported to share the hour of private lessons. Since my teaching style is pretty active, this became really painful as the day continued. There was not a minute between as one mega-class dovetailed into the next. There is plenty in the plus column, however. Already noted is the camaraderie between the faculty, meeting the students – especially those that return from previous years – and their families. Many volunteers help things run smoothly and they have such big hearts to serve the faculty and help make us comfortable in their country. 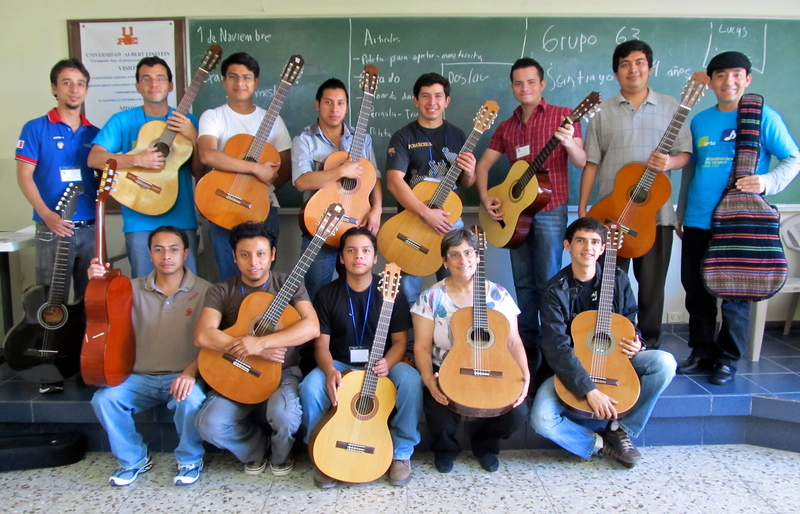 Leading a class of guitar professors from Guatemala,El Salvador, Costa Rica and Nicaragua. This year’s festival is my 4th visit to El Salvador. My first visit was for the IIIrd Festival in 2005. It’s always exciting to work with a group of local teachers and see them progress in their knowledge and confidence about setting up new students to be life-long learners and lovers of guitar. Couple that with the loving nature of the Salvadoran people, and it’s an even richer experience. 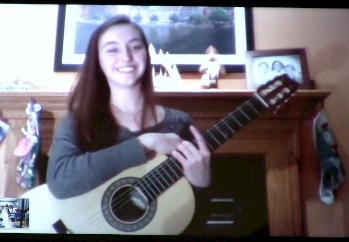 I am making progress on a solo guitar CD…very, very slowly. Jim and I have collaborated on several recordings, some of which should probably be re-released on disc or at least as d-loads,but none of those were solo guitar projects. In the middle of getting the recording more earnestly underway, came two playing events in the same week. Each had it’s own specific set-list. Both of them contained some nice tunes. I wanted to take (at least!) one tune from each of those and record it for YouTube. In addition, since 2010 the Barrios piece “Bicho Feo (Tango Humoristico)” has been a really popular addition to my concert rep. 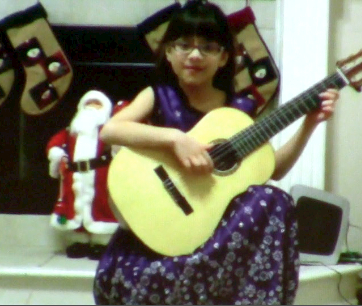 In July I performed it again in a solo recital and promised that I’d get a video of it as soon as possible. …AND HERE IS THE RESULT!! This famous and popular tune was requested at a family event I recently played at. This video is dedicated to Tammy and Robert and their beautiful daughters Riley and Reagan. This comes from a vocal song, so has the typical verse / chorus / bridge format. In and around the expected verses and choruses, the rest of this arrangement was sort of made up on the spot. I thought this take felt ‘fun’ – at least, it was fun to play. I hope it’s as fun to listen to as it was to play. This Barrios piece was known to be a favorite encore that was also referenced in his concert programs. The title means “Ugly Bug” and it refers to a particular bird whose call it attempts to imitate. Though he did not write it down, he did record it. However, all recordings were lost until recently. In 2009, two copies were discovered and donated to the Barrios Museum in Paraguay. The piece was transcribed by Tony Morris and it has been revived in performances by him and others who have received his transcription. As far as I know, this is the only Video of the piece. I was not able to find another anywhere. I hope you enjoy it. It has been popular with audiences in my travels as well!! Here’s the transcription of the music, done by Tony Morris. Here’s a short clip of the Bird it’s named after!! FOOTNOTE – A COUPLE OF COOL LINKS!! I spent some time searching for other videos of “Bicho” to confirm whether or not mine is the first out there. I did not find any other video recordings of it. However, I did find two interesting links. After only a week, my ‘Bicho’ video is on this Pakistani forum called “One Pakistan” and has a 5-star rating!! One of the concerts I performed at the University of Houston was covered in a Local Katy, TX news story. This started out as an email to family to express my love and appreciation to the most special people in my life. As the email took shape, I realized it should be expressed to everyone I know. My husband and I spent last weekend in DC celebrating with my youngest sister and her new fiancé at an engagement party given for them by some friends. We also visited with my brother and his family – watching TV and having fun. Yesterday morning when our plane landed back in Houston and we turned our phones on, there was an email saying that one of my musician colleagues had passed away suddenly, just a few hours prior, of cardiac arrest. It is shocking news. He was not old (’50’s), he was busy and active, and appeared to be healthy. Events like this shine a light on what is really important. We are all busy. As a self-employed musician, it’s natural to want to work as hard as possible while the opportunity is there. The busy work schedule makes it difficult to take time to get check-ups and routine tests just to be on top of things. Especially if you feel fine! If this busy, healthy, middle-aged guy could be suddenly struck down without warning, then it could happen to others, too. I guess it could happen to anyone. It’s always hard to lose family members. Or friends. When they are old or sick, at least you have some time to make the adjustment and say the things you need to say – whether to make wrong things right or just so they know how you feel. When things like this happen so suddenly and there isn’t any advance warning – well, that makes it very difficult for the loved ones left behind. Do what you need to (go for walks. Change your diet.) and stay on top of things health-wise. 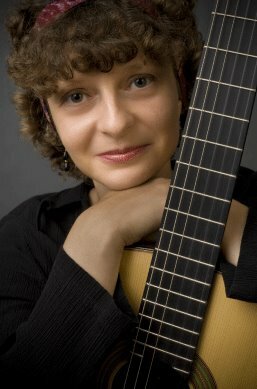 There is one more thing to add – another colleague passed away earlier this year, a beautiful guitarist who was only 42 years old. She had battled cancer for years, so in her case, she just finally lost her struggle. A friend of mine who works with her told me had regrets that he never told her how much he admired her as a teacher. So, he wrote me a note to tell me how much he appreciated and respected my work and our friendship. I want to tell everyone I love that they’re important in my life. That I am looking forward to many, many more years together. Mr. Rogers used to say – and it’s true – There’s Nobody else like you. Everyone has their place and their calling. I guess there’s never enough time to say those things as often as they *should* be said. My colleagues’ passing has given me food for thought. In their memory and as a tribute, Let us all say it now, to those we love, while we are able. 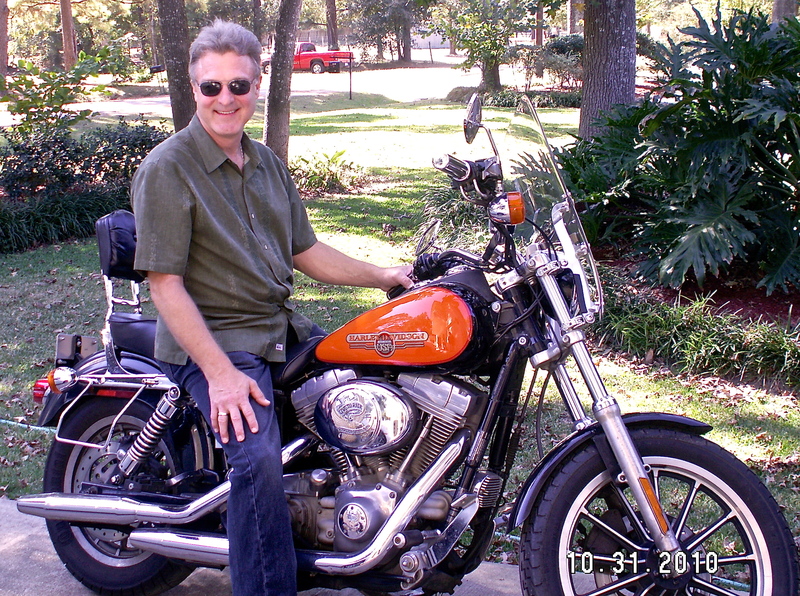 John Hendrickson – on a Harley! Rick Whitehead was my first guitar teacher. As my bio states, I was fortunate to be able to begin my studies with him and am grateful for his help and inspiration through the years. Though it’s his most recent release (2008), it’s actually an older recording that was finally taken ‘off the shelf’ and readied for release. Prior recordings are three trio and one solo jazz guitar disc. 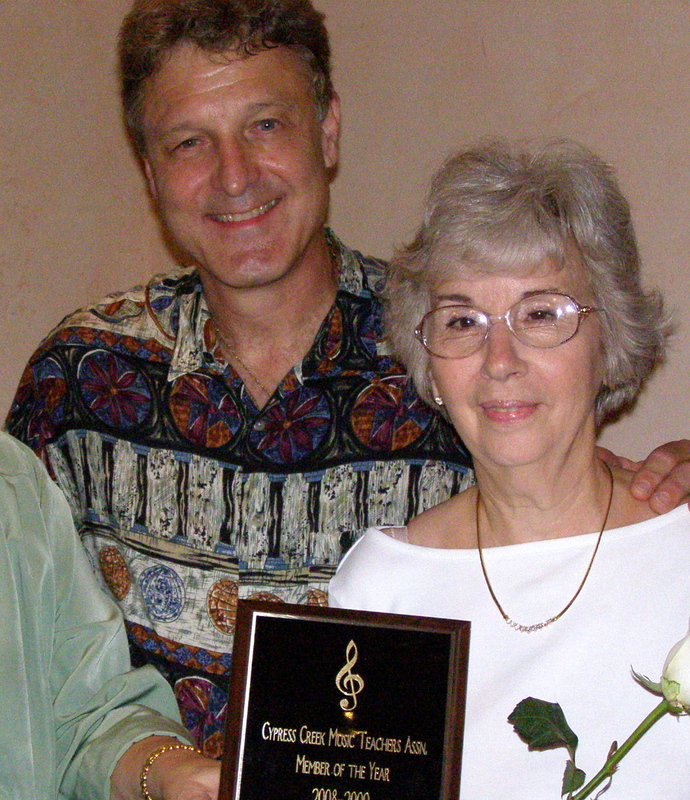 in 2008, The Rick Whitehead Trio took honors as Best Jazz Ensemble. This CD represents a project Rick started working on back in the ‘90’s, and then let sit on the shelf for years. Which brings up the next surprise: that Rick wrote three of the tunes on this project – “Wherever It Takes You,” “August Rain,” and the aforementioned “Children Playing.” As far as I know – there are no other recordings of his compositions and he hasn’t performed them live, either. They’re great tunes and hopefully, they will now find their way into the standard jazz rep of other artists as well. The disc includes quartet renderings of several tunes – ‘Caravan’ is one of those and is a stunning example of the blazing chops and level of artistry of Rick and pianist Stef Scaggiari, Dave Wundrow on bass and drummer Mike Sheppard. In addition,some tracks feature Rick having fun with the multi-tracker which shows another side of his playing and personality unique to this disc. “Guitaristic” is a fine complement to Rick’s previous CD’s. His talents as a guitarist and as a writer deserve wider recognition. I, for one, am very, very grateful this project did not remain on the shelf!